hies 12” Junior Bully is 100% digestible dog chew making them a great alternative to a traditional rawhide! This is a single ingredient product produced from free-range grass-fed cattle and sourced from Brazil. 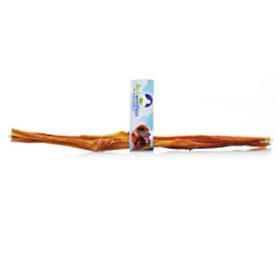 As with all of our products, Barkworthies are additive, chemical, and preservativefree dog chews. In fact, most Barkworthies products are single-ingredient chews, making them all-natural, 100% healthy & 100% safe for your dog. Not for human consumption. Please supervise your pet while giving a treat or chew.